A woman waits for a guest. The guest is late. A tray of tea swings back and forth like a pendulum, counting the passing minutes. Time passes. The tea grows cold. Perhaps he is not coming? Perhpas he has abandoned her? She refuses to entertain any such idea and invents ever more elaborate excuses for him. In a powerful, poetic and chilling depiction of misplaced hope, Howard Barker's intriguing play explores the extreme lengths we will go to in order to excuse the antagonism of others towards us as rational behaviour to protect our feelings. 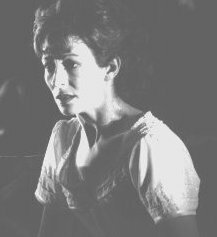 UND is an intense study of self deception and manipulation for solo performer, here played by Melanie Jessop, also seen in The Wrestling School's productions of Judith and Victory. It was directed by Howard Barker himself, with a striking setting designed by the same team that created Ursula in 1988.
" an exhilarating poise between determination and terror. Thomas Leipzig's beautifully designed Newton's cradle.." The Times "
UND was a co-production with Derby Playhouse, Sheffield Crucible Theatre, and Plymouth Theatre Royal supported by the Arts Council of England and the London Arts Board.